Charlotte Perkins Gilman was born in 1860 and was a writer, lecturer, and feminist who fought for women’s rights in society and in the home. She wrote prolifically on the subject of women’s issues especially focusing on the inequality of women by challenging the reasoning and basis for women’s restricted role in society. She wrote Women and Economics which not only called for changes in marriage and family but also stated that women could not be truly independent if they were dependent on their spouses or other male family members. Soon after the birth of her daughter, Gilman experienced depression and received treatment from well known physician, Silas Weir Mitchel. He prescribed a treatment of rest which often included isolation from friends and family, a special diet, and massage and electrotherapy. As one of many medical and scientific experts who debated “the woman question,” he defended the notion of significant differences between the sexes and argued that an epidemic of neurasthenia, or nervous exhaustion, was rife among women who attempted to exceed their natural limits. Gilman felt the treatment made her worsened her health later wrote a semi-autobiographical short story, The Yellow Wall-Paper, as an indictment of the medical profession and the social conventions that restricted women’s professional and creative opportunities. Originally submitted to the Atlantic Monthly, it was immediately rejected. It was published more than a year after it was written, in The New England Magazine, in January 1892. While some 19th-century readers did appreciate the message hidden in The Yellow Wall-Paper, the story also resonated with many in the women’s movement of the 1970s. Since their rediscovery of the tale, the text has been republished many times, continuing to intrigue readers. Thanks to Charlotte Perkins Gilman, progress towards women’s health and independence was made even after her death in 1935. The online exhibition features a range of resources for educators and students, including lesson plans developed by classroom teachers for middle and high school courses, a higher education module developed by a scholar working in the discipline for undergraduate and graduate students and instructors, educational online activities, and additional resources. 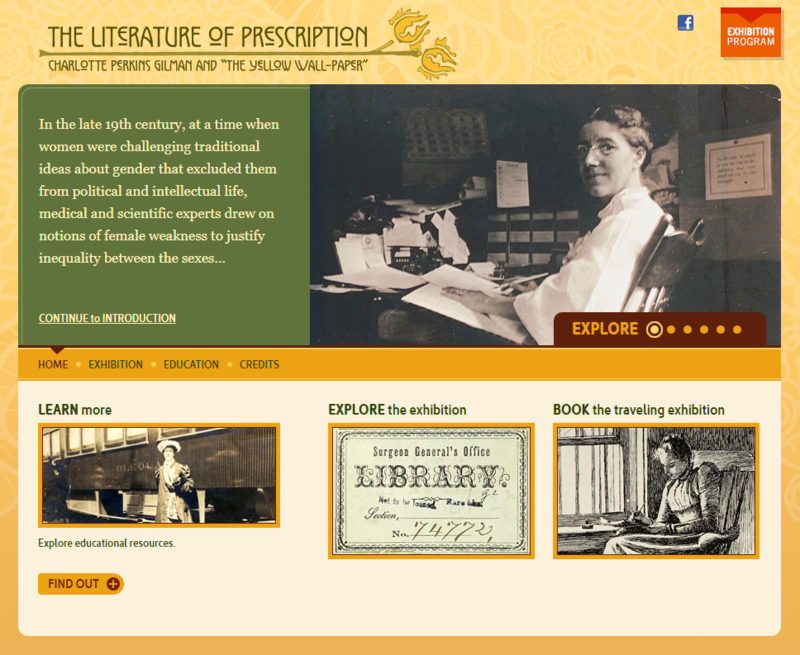 The Literature of Prescription is also a traveling exhibit which your library or organization may wish to host. Learn more about booking the exhibit on its Book An Exhibition web page.